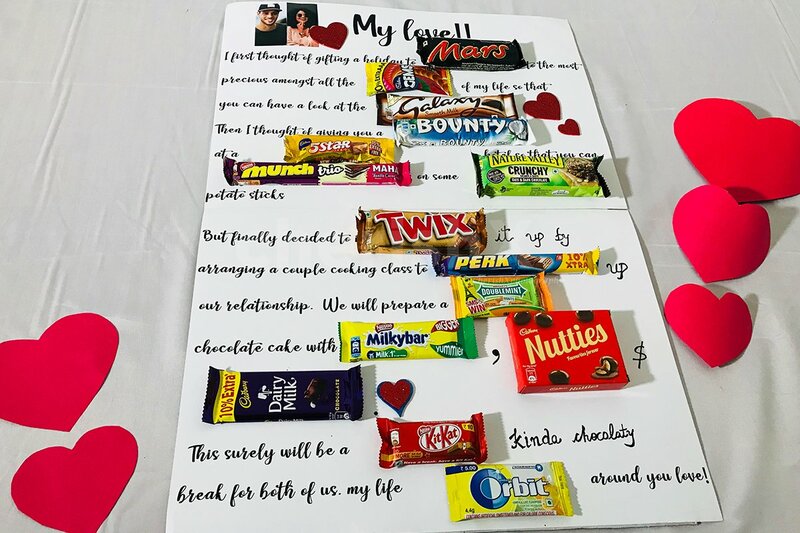 A 'sweet' message card- written with the help of actual chocolates! I first thought of gifting a holiday to Mars to the most precious amongst all the Gems of my life so that you can have a look at the Galaxy. Then I thought of giving you a Bounty at a 5 Star hotel so that you can Munch on some Crunchy potato sticks. But finally decided to Twixt it up by arranging a couple cooking class to Perk -up our relationship. We will prepare a Doublemint chocolate cake with Milky Bars, dairymilk & nutties. This surely will be a Kit-Kat break for both of us. My life Orbits around you love! I bet this surely made you Snickers. The surge will be applied for same day bookings.